One of the biggest heartbreaks surrounding the Hurricane Katrina aftermath is the lack of preparation made for such a large-scale evacuation – and the despair of those who have become separated from their loved ones in the middle of the chaos and who have no idea if they are safe, or even alive. Do not be done unprepared if a disaster strikes your family. Before you need it, you and your family should have a plan in place for reaching safety and for keeping the others apprised of your situation. Do not rely on rescue workers and relief organizations to provide for your family's safety, or to be able to tell you whether or not they are okay. These organizations, if they're even present, will almost assuredly be overwhelmed and understaffed. They will be dealing with the situation in a triage manner of priority and even if they are able to help locate family members, their information may be incorrect. Make sure you have alternative plans for keeping your family safe and connected. Have at least two out-of-state relatives or friends designed as check-in home bases, by whatever means necessary. Make sure that everyone knows to call, email or snail-mail these places as soon as possible, they should be separated in an emergency. Of course, you should offer to provide the same service in return. Note: sometimes SMS / text messaging will work even if the cell phone services are spotty and unreliable. Use this feature whenever you can not make a good connection otherwise. Send as short a message as possible to ensure delivery, even just your name and "okay" to let everyone know that you are safe. For localized emergencies (fire, tornado, etc) have a designated meeting spot near enough to reach, but far enough away for safety. Everyone should know to meet there for a check-in as soon as they safely can. Ideas include a local store or church, the corner mailbox, the neighbor's yard, a nearby park or school, etc. You should set up more than one, to allow for varying degrees of disruption. For example: in case of house fire, everyone meets at the lamppost on the corner. But in case of wider-spread destruction, go to the church at the top of the hill. For truly large-scale events, such as hurricanes and massive earthquakes, evacuation orders will likely supersede these options, but if possible try to regroup first then evacuate. Set up a "bug-out" bag (see article here) and make sure that everyone knows where it is and that it is to be a part of any evacuation except a house fire – everyone should know never go after any material items in the event of a fire. Also make sure that everyone knows where emergency gear such as fire extinguishers, first aid kits, evacuation maps, emergency numbers and so forth are kept. If you have a bank account set up for emergency situations, make sure that all responsible adults have access to it and know how to get to it. Also make sure that anyone who does have access is a responsible adult. You do not want to be out on the street after a disaster only to find your emergency account empty because "someone" needed shopping money (or worse) last month. Designate someone in your family to be the "tribal leader" in the case of an emergency. Normally, this will be a parent or guardian, but in some cases it may be an adult child or other relative. Choose someone who has shown that they can operate with a clear head in emergencies, who reliably makes smart choices out of bad options and who has demonstrated an ability to lead without abusing power. Work out an order of second and third choices, in case the originally chosen leader is incapacitated. In an emergency, it is vital that valuable time not be sent debting various alternatives. Unless someone clearly sees a better option that the leader is not aware of, everyone should know beforehand that, no matter what normal give and take the family may be used to, in an emergency situation they are to do exactly what the leader says without argument Egypt hesitation. 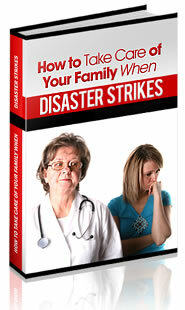 Do not leave your family's survival in an emergency up to luck and quick thinking. There are far too many things that can go wrong in such a situation. Set up a plan and run your family through it a few times a year, just like a fire drill, to make sure everyone knows what to do. First, get to safety. Second, take a headcount if possible. Third, follow the leader until the situation stabilizes. Fourth, try to make contact with missing members. And finally, if the emergency is a long-term situation, set up a "base camp" with routines and regular check-ins to establish a sense of order and safety as soon as possible. Facing the prospect of partial or even complete destruction of everything you know and love is a fearful thing, and many people would rather avoid thinking about it as much as possible. But knowing that your loved ones are prepared to make it through such an event, and that they know how to take advantage of this preparedness, goes a long way towards making the crisis bearable.